Judges have embarked on the challenging task of selecting the area’s best buildings of the past decade after an impressive response to the return of the Angus Design Awards. Ten years since the Angus Council-operated scheme was last staged, a flood of high quality entries have come forward in the quest for recognition. More than 40 submissions were made across the four award categories of new build developments and individual homes, building extensions and conversion or restoration, with entries from every corner of the county. Civic, commercial and residential properties all featured in the entry list. 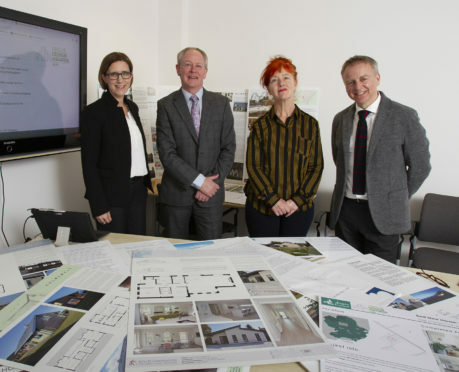 The judging panel, comprising V&A Dundee director Philip Long, Lucy Byatt, director of Hospitalfield in Arbroath and The Courier’s Angus chief reporter, Graham Brown, got round the table to run their eye over the entries for the first time yesterday. The entries will be considered against a range of criteria, including sustainability and the materials used, the quality of design, their creative context and the contribution made to the architecture of Angus. Although the panel will decide the category finalists, the overall award will be chosen by the public, with readers of The Courier being given the task of selecting the building of the decade through an online poll. An awards ceremony will be held in the spring to which the shortlisted entrants will be invited, including architects and property owners. Mr Long said: “It has been a pleasure to see the breadth of quality of design that has happened across Angus in recent years. Council development standards convener, Arbroath West and Letham councillor David Lumgair said: “The quality and design of new development is very important in delivering that vision. “Good design delivers benefits for everyone. “In Angus, we have talented designers and developers who recognise the benefits of good design and that has shone through in the submissions.